I too got excited about the recent development of the brushless direct drive gimbals, pioneered by AlexMos. So far, all DIY or commercial solutions (I know about) are for cameras of the GoPro size or larger, but I was interested in building a gimbal for cameras of the key chain type, i.e. a micro brushless gimbal. I did encounter, however, various problems, and so I went into trying to understand better the brushless direct drive. My considerations and results please find below. If the motor is driven such as to hold a certain position, but a mechanical torque is applied to it, then the motor will turn somewhat to avoid the torque. If the torque is removed the motor will return to its original position. The stiffness, with which the motor reacts to a torque, is the stronger the larger the applied voltage. If, however, the torque becomes too large then the motor will snap into a new minimum position. It’s like scraping with a stick across a washboard, where the height of the ripples is given by the voltage and the period by the number of motor poles. These observations are of course totally expected and easily understood; they characterize the static behavior. The motor stiffness determined by this experiment is an important motor parameter. If the motor is driven such as to hold a certain position, and the gimbal is first deflected (by e.g. tapping it with a finger) but then released, then the motor will return to its original position within a certain time. For my gimbal setups, the motor returns with a pronounced oscillatory behavior. The gimbal (motor+mount+camera) is thus characterized as an under-damped second-order process. 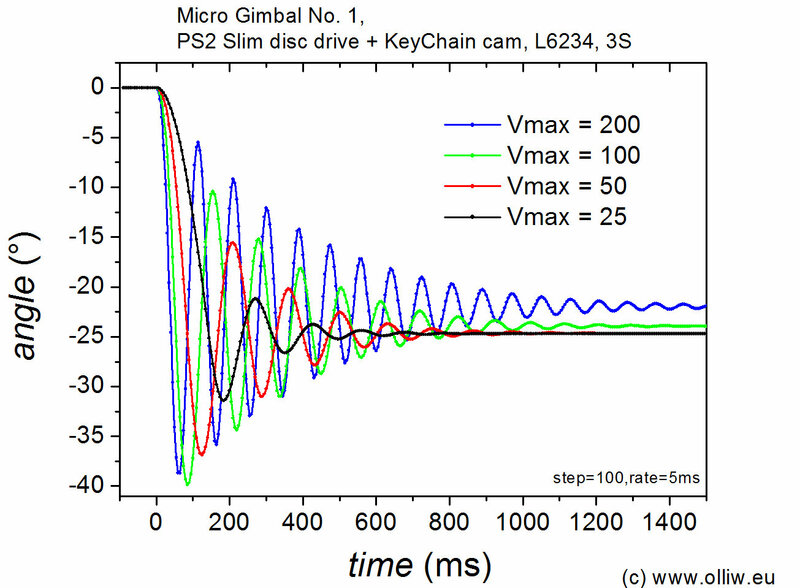 The gimbal oscillation frequency and damping coefficient are important motor parameters, characterizing the dynamic behavior. If the motor is driven such as to rotate at a fixed speed, then the motor can get into a situation where it doesn’t move forward anymore but oscillates permanently around a certain position. For this to happen the speed has to be above a threshold speed. 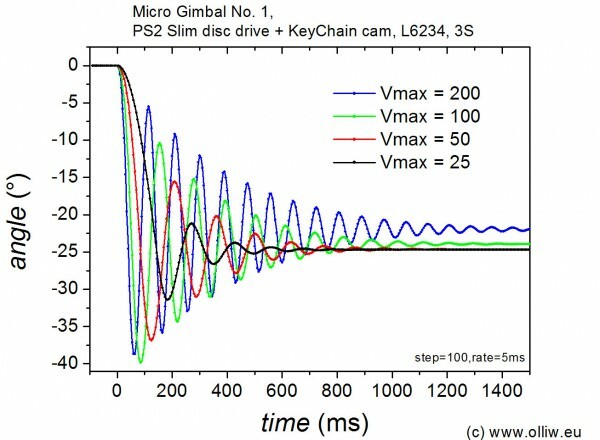 The oscillation frequency is the faster and the amplitude the smaller the larger the nominal drive speed is. This non-advancing oscillatory state can be reached by e.g. taping the camera to hold, or by trying to speed up the motor too fast. These observations indicate that the gimbal system is highly non-linear. They came as a surprise to me, and it had in fact been these findings, and my desire to understand them, which triggered all the work presented here :-). I have also build a 1-axis test gimbal using a EMax CF2822 (12n14p, rewound 75 turns, 15 Ohms) and a Lumix (ca. 150g) camera, for which I made also observations (1) and (2) [I did not check for (3)]. The starting point for the theory of the brushless direct drive is the observation, that the brushless motor is essentially used as a 3-phase synchronous motor, and is driven by applying a 3-phase sinusoidal voltage to the phases. I won’t go into this here; I assume that this is well understood by the reader. Having established the model for the direct-drive gimbal, Eqs. (2.18) and (2.19), we can discuss some typical situations. In fact, we can consider now exactly those three cases presented in Chapter 1.
which emphasized the relevance of the parameter . If the torque is too large, the motor will slip, since the sine function is bounded. showing that the gimbal represents a second order process. It may be over-damped then (which is good for control) or under-damped then (which is harder for control). As expected, the resonance frequency increases (i.e. the system becomes faster) with increasing voltage amplitude (stronger motor) as well as with decreasing moment of inertia (gimbal/camera easier to turn). Interestingly, since somewhat unexpected, the system becomes less damped with higher voltages, which may explain why for a given setup smaller voltages yield a better gimbal performance (as control is easier). For my micro and Lumix test gimbals I observe strongly under-damped oscillations in a step response experiment [observation (2) in Chapter 1], i.e., the parameters are unfortunately such that is quite small. (1) For small phase lags or , oscillates harmonically with frequency : (see e.g. this animation). That is, the motor advances with speed , but with harmonic oscillations superimposed: . The amplitude , or energy of the pendulum, is small for small speeds, but increases with speed. In the video shown in Chapter I the superimposed oscillations are observed as a sort of stuttering at intermediate speeds (below the threshold speed). (2) The pendulum may be excited strongly, such that it permanently overturns (see e.g. this animation). The phase lag hence advances constantly with a non-harmonic periodic function superimposed: , where is non-trivially obtained. Hence, the motor is not advancing but oscillates around a fixed position: . The amplitude of the oscillation decreases with larger energy of the pendulum or speed . The crossover between the two regimes occurs at the point there the pendulum has just enough energy to complete a full swing (see e.g. this animation) (in the phase space diagram this is the separatix), and which situation occurs is controlled by the energy of the pendulum. The energy in turn is roughly determined by the square of the speed, . These findings explain nicely all observations (3) in Chapter 1. Using the micro gimbal test setup I recorded the step response for four different voltages. More precisely, the motor was driven using the L6234 driver IC at 3S, and the H bridges of the L6234 were driven with PWM signals with 8 bit resolution at 8 kHz. The different voltages were set via different maximal PWM duty cycles. Vmax = 100 e.g. corresponds to a duty cycle of 100/256. A step of amplitude „100“ was applied, which corresponds to a 100/252 * 60° = 23.8° mechanical turn of the gimbal. The angle was determined by integrating the gyro signal (MPU6050) taken every 1 ms, the angle value was however recorded „only“ every 5 ms. The gyro setting was DLPF 256, FS 1000, SR 0. I repeated the measurements several times and found good reproducibility. The curves for the four voltages Vmax = 200, 100, 50, and 25 are shown in the following diagram. The step occured at time t = 0. The oscillatory response corresponding to a highly under-damped second-order process is clearly observed. Furthermore, the above trends are clearly seen: The higher the voltage the larger the frequency and the smaller the damping. Taking into account that the derived model is also able to reproduce observations (1) and in particular observations (3) described in Chapter 1, we can conclude that the model captures the behavior of the real gimbal quite well, at least on a semi-quantitative level. Quantitatively, some discrepancies are observed. The damped oscillations are reasonably but not perfectly fitted by a damped harmonic oscillator; the period shifts somewhat during the relaxation, and the damping is not perfectly exponential. This can be, however, due to many reasons, e.g. the friction model is too simplistic, the non-linearity is not of sine-type e.g. due to cogging torque moments, or the process is higher-order. Also, a step of „100“ or 23.8° might be too large for the considered linear regime to hold (I might repeat the measurements for smaller steps, but I find the above results convincing enough). To give some numbers, the resonance frequency decreases from ca. 12 Hz at Vmax = 200 to ca. 7 Hz at Vmax = 25, and the damping increases from ca. 0.04 to ca. 0.15. The step responses do not settle at 23.8° for the larger voltages. I was suspecting that this comes from the limited gyro bandwidth, which introduces integration errors. I am not sure about it, however. For the test gimbal with the Emax CF2822 and Lumix camera I obtained very similar data, only that the frequencies are generally somewhat smaller, it is ca. 7 Hz at Vmax = 200. The same trends are however observed. The above results demonstrate the challenges in controlling direct-drive gimbals using PID controllers. The process is rarely strongly over-damped, where the transfer function could be approximated by a model with a dominating time constant. In contrast, the process is nearly critical or even strongly under-damped as in the case of my micro and Lumix test gimbals, and tuning is much „harder“ since a complex or nearly complex pair of poles needs to be compensated for instead of only one real pole. This implies that the conventional rules for tuning PID controllers do not apply, and that the feedback loop is quite sensitive to parameter variations. Using a parameterization of the P, I, D values which is better adapted to oscillatory second-order plants might simplify the tuning process. and the mechanical properties are described as before by Eq. (2.17), i.e. This is a second-order process as for the brushless direct-drive gimbal, but with the crucial difference that the resonance frequency is zero. That is, the DC motor direct-drive method is intrinsically over-damped. Note, in contrast to the voltage-controlled DC motor direct drive a low-frequency assumption was not necessary; the results hold here for all frequencies. Besides that, one obtains also an over-damped second-order process with zero resonance frequency . Hence, controlling the current or torque, respectively, should be an attractive approach for direct drive gimbals. though having gained some insight I must say that there are still some things I do not understand as well as I would like, and which confuse me. Besides some other details, what really astonished me is that also the „big“ gimbal I tested showed nearly as pronounced oscillations. For the moment I changed my strategy, I am just building up a mechanically working micro gimbal along with the firmware and software environment, and then I will put it into a real flying machine and see how it does… maybe some aspects which worry me are not as harmful in practice as I think. I am bit slow currently on doing this, but I am still on it. Would be nice to read about your progress an efforts somewhere. 1. Is the problems of a micro gimbal related to size / mass of the camera? 2. Have you taken a look at vectorDD ready built solutions? Would it be possible to use that same design but for a micro key chain camera? 3. Does smaller size / mass of camera make it more difficult to have an auto stablization gimbal?